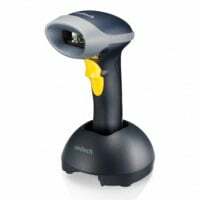 Delivering efficiency, durability and compact size, the device combines superior 1D and 2D barcode scanning with the freedom of wireless technology. The well integrated mobility design allows users to move around without being restricted, while supporting high comfort over long periods of operation. MS842P is a friendly device for a broad variety of markets and applications. While sustaining a 1.8 meter drop to concrete, MS842P incorporated with IP42 rugged design for protection against dust and moisture. In additions to offer a 10M operation range via its USB dongle, the simple plug-and-play design of MS842P makes the installation much easier without complicated set-up. Moreover, the built-in long life trigger of 10 million times guarantees a continuous productivity for best reliability. In addition to all of those benefits, the MS842P helps to store data in a buffer mode while it is out of range of the wireless signal, and also upload the data when it gets back in range. The Unitech MS842-2UPBGC-SG is also known as UNI-MS8422UPBGCSG	or MS8422UPBGCSG	.